With Halloween just a few days away, it’s pumpkin’s time to shine! Leave the carving to the experts this autumn and check out some of London’s best pumpkin dishes. 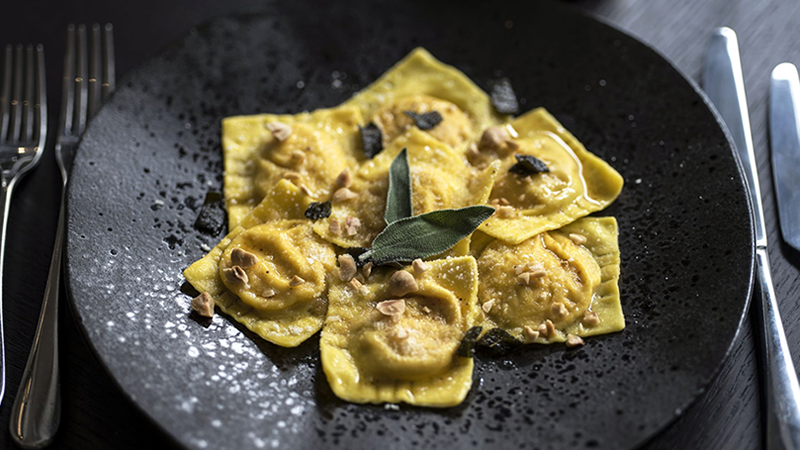 If you’re more into pasta than pumpkin spice, you’ll love the ravioli di zucca at Margot, a modern Italian restaurant in Covent Garden. The delicate pasta parcels are filled with silky pumpkin and ricotta and served with sage butter, toasted hazelnuts and Grana Padano shavings. Just make sure you leave room for dessert – their tiramisu is not to be missed. If you’re celebrating this month, do it in style at this stunning French restaurant next to Spitalfields Market. Set in a former Victorian chapel, it’s the perfect place to wine and dine someone special. 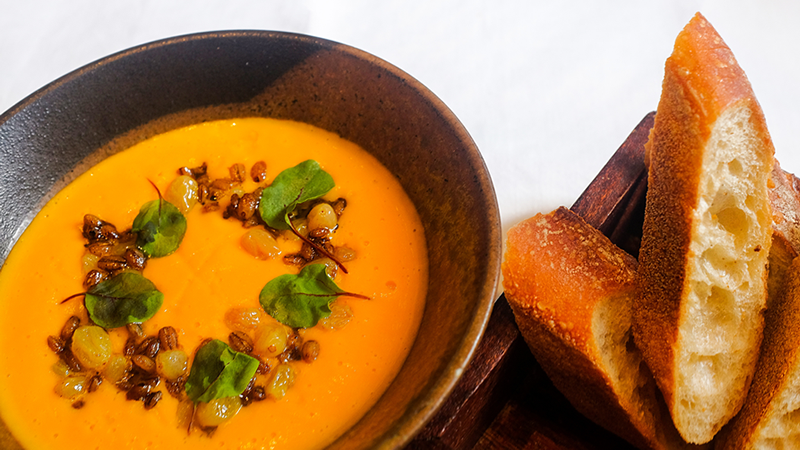 If you can resist their famous lasagne of Dorset crab, why not celebrate the season with their pumpkin velouté. 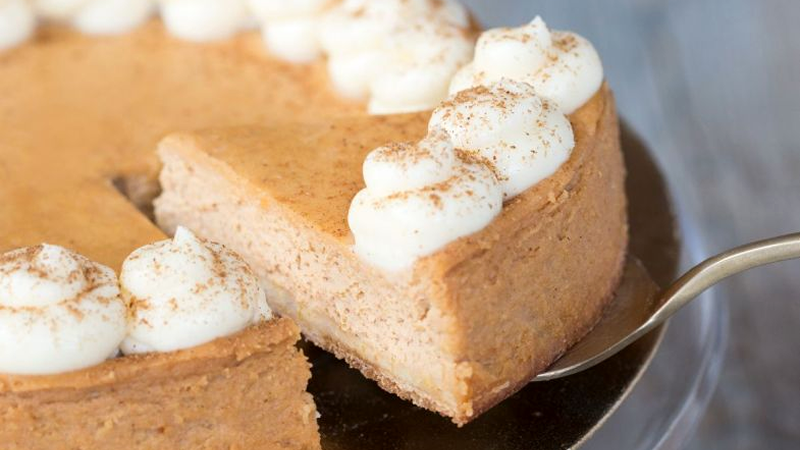 Satisfy your sweet tooth with this creamy, spiced pumpkin cheesecake, topped with vanilla frosting, and sprinkled with cinnamon. If you couldn’t manage a whole cake, Konditor & Cook are also selling mini versions for £1.50 each, plus these adorable Noisette Pumpkins filled with hazelnut praline. 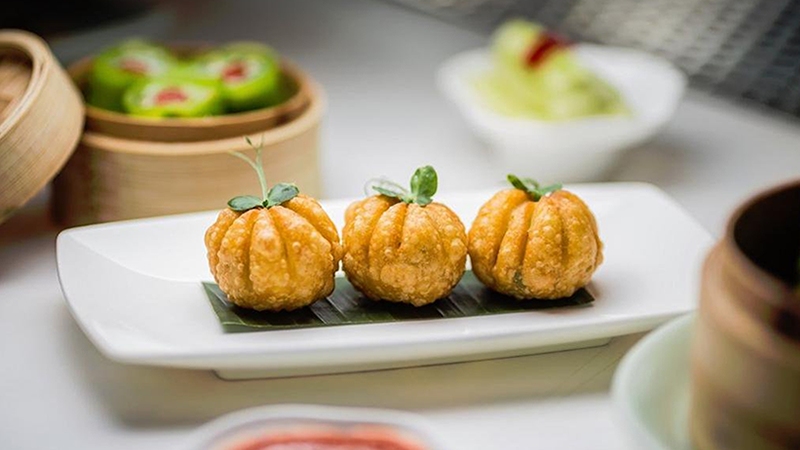 Leave the pumpkin carving to the kids and treat yourself to a dim sum feast at Yauatcha. At their restaurants in Soho and Broadgate Circle, they serve classics like har gau and shui mai, plus luxe dishes like Wagyu beef puffs and lobster dumplings with tobiko caviar. Get into the Halloween spirit with their roast duck, pine nut and pumpkin puffs – they’re almost too cute to eat, but somehow you’ll manage. 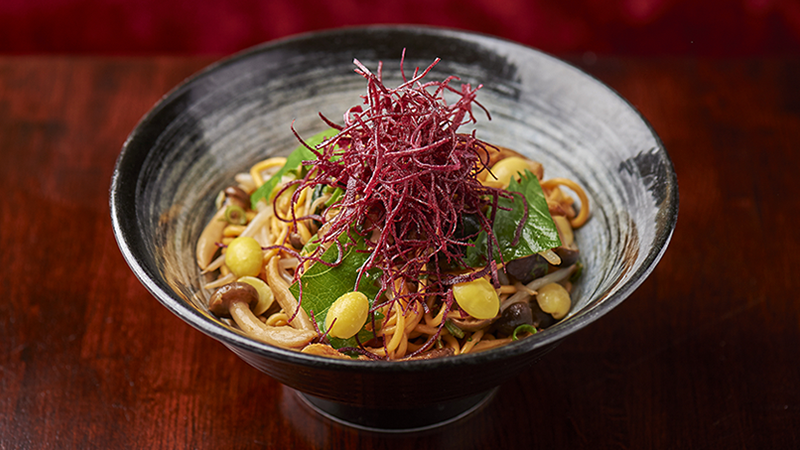 If you fancy a change from classic curries, this buzzy Soho spot is a great place to start. They’re famous for dishes like Keralan fried chicken and tandoori monkfish, but you would be mad to miss out on meat-free dishes like samphire pakoras or smoked aubergine with sesame raita. 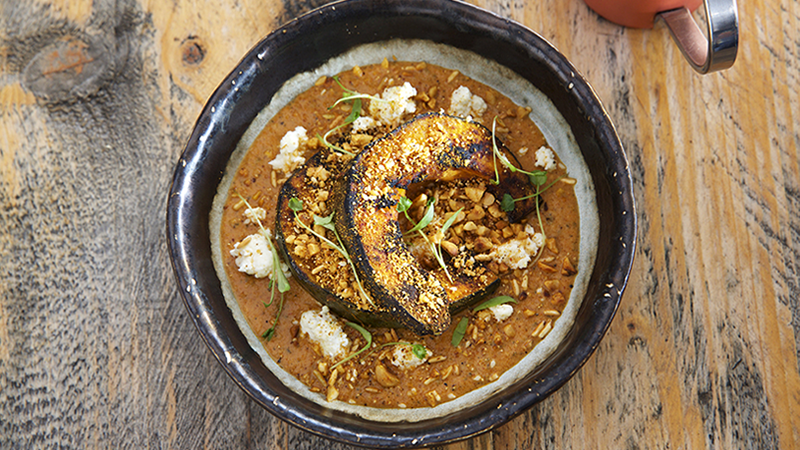 Best of all is this dish of paneer and pumpkin in makhani sauce, topped with puffed rice and hazelnut crumble. On a street lined with great places to eat, it can be tough to stand out from the crowd. At The Ninth, they make it look easy. Chef Jun Tanaka and his team serve French and Mediterranean-style dishes that change with the seasons, as well as house-cured meats and fish. 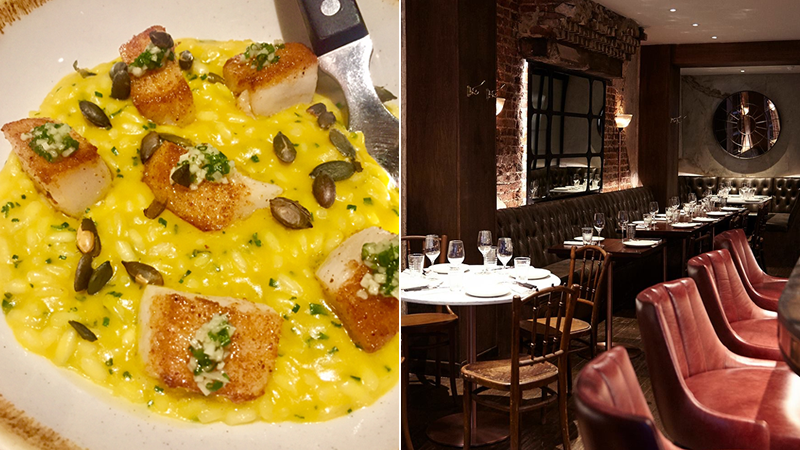 If you dine this month, don’t miss this vibrant pumpkin risotto topped with seared scallops and pumpkin seeds. Photo Credit: Sam The Food Fan. Visit her blog to read her review of The Ninth. 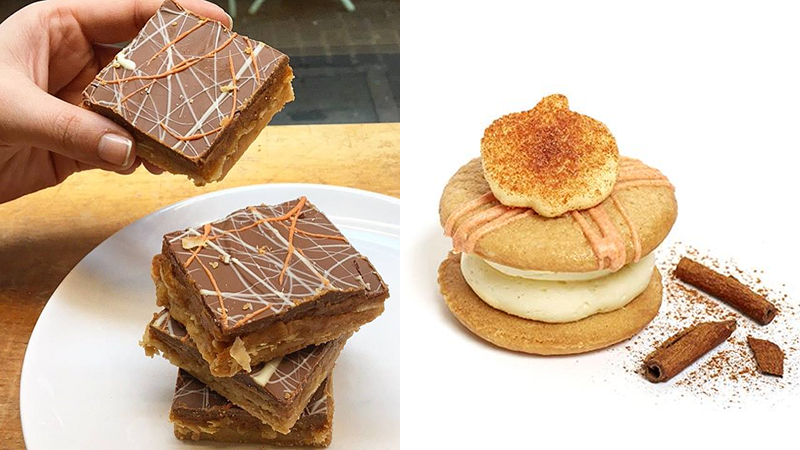 If you’re out and about in Soho, make sure you pop into Cutter & Squidge for a seasonal sugar hit. Their pumpkin spice latte biskie has a light vanilla cream cheese filling, a spiced pumpkin compote centre, and a cinnamon sugar cookie on top. It’s a cross between a biscuit, a cookie, and a cake – hard to define, but easy to devour! We’re also keen to try their new traybake which is flavoured with pumpkin, coconut and spices, then topped with a thick layer of chocolate. This laid-back pizzeria on Exmouth Market is the perfect place to unwind after a long day. They use a special twice-cooked dough made with rice, soy and wheat flour, so their pizzas are lighter and easier to digest. 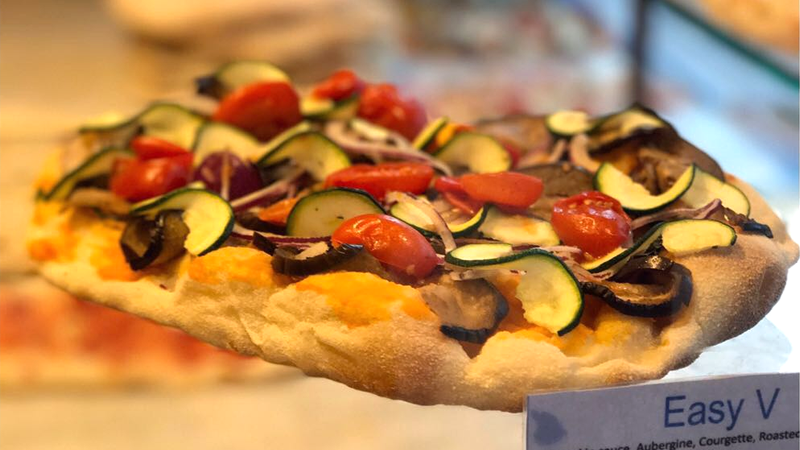 The Easy V is topped with aubergines, courgettes, roasted tomatoes and onion confit, plus a pumpkin base instead of the traditional tomato. If you’re more into meat, try the Triple P with pumpkin, Tuscan pancetta, and smoked provola. 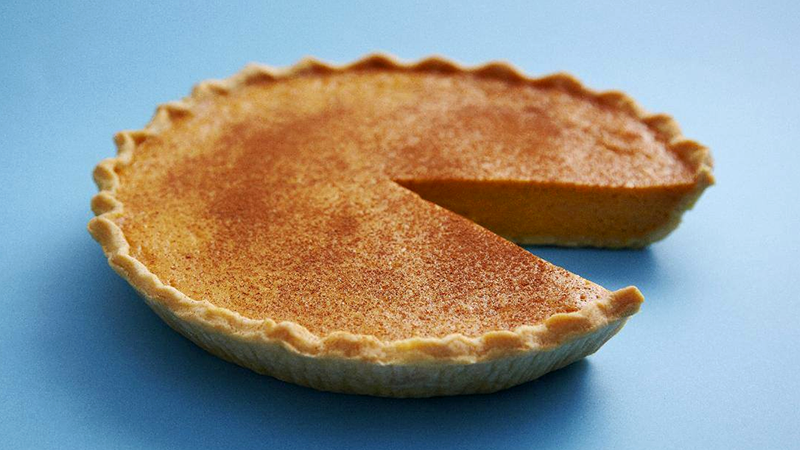 If you fancy spoiling your work mates, why not swap your usual tea break treats for this cinnamon-dusted pumpkin pie? Serve it warm with a dollop of whipped cream and you’ll be the office hero for a week at least. Alternatively, treat yourself to a pumpkin whoopie pie or one of their chocolate pumpkin cupcakes – perfect for Halloween. What’s your favourite way to eat pumpkin? Let us know in the comments. There are some really interesting recipes.